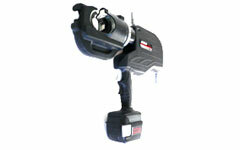 LIC-5431 Battery Operated Tool Lithium Ion Tools: Izumi Products. Accepts existing 12Ton U Dies for conductors up to 400mm2 Cu. New Environmentally friendly Lithium-ion battery - light weight - no memory effect. New Slide in battery insertion gives a more secure connection with the tool. 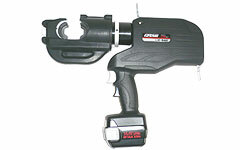 The LIC-5431 is the battery operated 12ton output tool to accommodate shell type dies widely used in the industry. The new rapid advance system reduces tool run time, giving more crimps per battery charge. Specify charger model & input voltage required. Battery operated hydraulic compression tool. 31mm jaw opening G head. Well balanced & compact pistol type tool. Accepts 12 ton shell type dies.